The ACOS5-64 Evaluation Kit from ACS is a complete software package designed to to enable system administrators to test and deploy cryptographic PKI logon and other applications. The ACOS5 card is an advanced cryptographic smart card that fully complies with ISO 7816-1/2/3/4/8/9 and is specially designed for public-key based applications and for enhancing security and performance for RSA public-key cryptographic operations that are essential in smart card PKI, digital signature and high level security requirements. The kit comes complete with an administrator as well as a user package, enabling the evaluation and deployment of cryptographic applications for both roles. The CSP/ PKCS#11 middleware, developed by ACS, ensures that the ACOS5-64 cryptographic smartcard is compatible with both Windows and Linux environments. 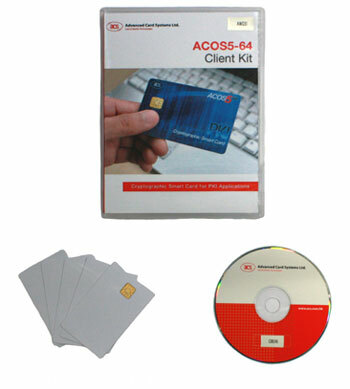 Once purchased in this kit, the middleware can be installed for any number of cards and users. The ACOS5-64 supports Windows 7 and Windows Server 2008 (x64 as well as x86). CSP middleware Enables your ACOS5 cards and Cryptomate to work with Microsoft browsers, email clients and custom build applications. PKCS#11 middleware Enables your ACOS5 card and reader to work with other browsers, email clients and custom build applications. Smart Card Certificate Manager Allows you to manage your electronic certificates in your ACOS5 Cryptographic smart card. ACS Card Tool Allows you to send commands directly to your PCSC-compliant smart card reader and cards including ACOS5 cards. Logical access card for digital certificate storage. 64K bytes memory. The ACOS5 middleware is available to purchase, providing Windows and Linux compatibility.